Picked up the Richie and Stovall from the Mile High auction. Down to the following 11: Jackson, Keeler-throwing, Miller-no sunset, McLean, O'Connor, Sheckard, Stahl, both Wagners and both Youngs. Ok Ed, after adding two to your previous E-Monster number (and double-checking with your needed list), your new number is 188. And thanks judsonhamlin and Fistner10, your numbers have been updated and () removed. Any new members to join our club? Slight bump up to 58 for me - added these two from eBay yesterday. Oakes has always been a desirable pose. A Nadja back of this one. Last edited by Leon; 04-19-2018 at 08:19 AM. Gorgeous card, Leon - I am mostly a lower-grade collector but this was actually a card I had planned to find in better condition. It's one of my favorite cards in the set. But for $30, I couldn't resist the urge to add it for now and upgrade later. On kind of a mini E90-1 run this week. Picked up four more, including the Leach throwing for another six points and a bump up to 64. Just got a Dougherty, so now I'm at 138. Please bump to 76 when you have time. 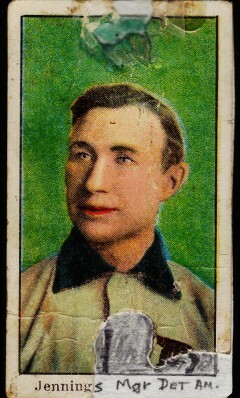 Picked up a few of the tougher ones recently, including Karger, Joss Throwing, and this Keeler red background. Thanks! Last edited by Cozumeleno; 05-02-2018 at 09:28 AM. that keeler IS a toughie...congrats! Thanks - the more I looked for it, the more I thought it was tougher than the throwing/horizontal. I checked the pop reports today and, while that's not the only indication for rarity, noticed that it was in fact graded fewer times. I settled for this one after a nicer AUTH sold for more. Happy to have it and the back is clean, which was a bonus! Boosted by a pretty rare Howell wind up card, I’m at One Hundred Twenty Two. Essentially half way on the Kraken but two thirds on the set itself. I’ll keep Cracking on the Kraken this summer. Happy to lend a helping Howell Brian. Consider your E-Monster # boosted to 122. Thanks for the follow through...Mr Arker. 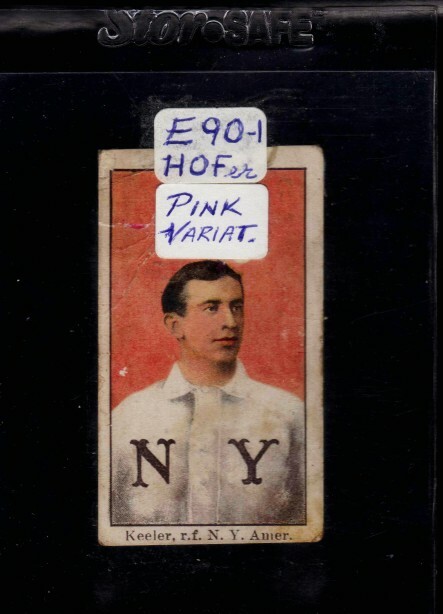 Here is Mr. Summers, probably one of the more commonly found subjects in the E90-1 set. Actually, I don't see many e90-1s centered that nicely. Great looking card. Howling Winds or Howell Winding (up), no matter how you say it, this card is not common. Small bump up to 82 for me. This trimmed Chief Bender from a pickup last week was my 70th card. Nice new pick ups Brian and Cap. My Kraken number would be an 8 at this point so I can't really compare to your guys sets. Welcome, and no need to compare...just build upon your Inner Kraken. Thanks, Andy - hope you're well. And Brian is right! Look how far back I am from others. Last edited by Cozumeleno; 06-24-2018 at 05:48 PM. I picked up 5 commons and this crazy looking Jennings for my 2nd set. Hi Ted, looks like someone decided to do a little black and white repair on the damaged Jennings...I like it! With your pickups I have adjusted your current Kraken rating to 101 (let me know if the Jennings is a duplicate, and I will drop you down to 100, which is still an impressive century mark). Until a better one replaces it, this Jennings is part of the set. 101 sounds good to me, thanks. Just picked up a couple more so please boost me to the double digits with a 10. Thanks a lot man! I picked up HOF George Davis and the No P version of Bransfield, so I’m seeking an update of +2 Krakens when our tally man gets the chance. Picked up the Stahl from Steve S. So that leaves me needing Jackson, Keeler (throwing) McLean, Miller (no sunset), O'Connor, Sheckard, both Wagners and both Youngs. As usual, too lazy to do the calculation. Look forward to seeing all the E90-1 collectors next week in Cleveland-booth 1025/1029. Kraken updated for both of you two. And Ed, you are currently at 250 minus 57, thus 193. I am a master calculator. Welcome aboard Jason...it is always suggested to take the Kraken for a test spin before committing, and Mullin and Sweeney are fine choices. Picked up a Keeler throwing for 3 more points so that gets me to 141. Now the fun really begins. Picked up 8 cards at a recent auction. 4 Points for Plank, 1 each for the rest. 11 PTS + 2 PTS (2 existing E90-1's) = NOW 13 PTS total. We have another master set in the house...congrats! Can we see the Joe Jax that cracked the Kraken? Anyone see the beached Kraken in New Zealand? Last edited by frankbmd; 08-28-2018 at 09:03 AM. Last edited by Paul S; 08-28-2018 at 10:43 AM. The tough Karger and Keeler (throwing) plus some single pointers in H. Davis, Camnitz and Jordon will now post my score at 133. I'm feeling really good about having this many. I have over 3/4 of the set as defined by traditional methods and 53% of the more accurate Kraken score. Always glad to bump up the fellow whose E90-1 thoughts inspired this Kraken thread. Here's looking forward to when you break the 55% Kraken barrier. I was able to pick up a couple more recently as well. Please up me to the big 12 on my Kraken number. It's slow going, but still moving up at least. Can do Andy...my best advice is to corral them when you can. Picked up another 8 cards. All single pointers. Now that you are 21, enjoy an adult beverage, courtesy of the Kraken. Gibson (back view) gets me to 144. Insanely tough card. Congrats on the Gibson...one might argue that he and a few others could be worth more than 3 points, but I decided to keep them at this level because the hobby still has not fully recognized their relative scarcity. Really? My seat of the pants observations doesn't have Gibson as a relative scarcity. I haven't studied the set as others have though. The Gibson back view is a difficult card; just as difficult as the throwing poses of Leach and Wagner. I suspect each was a late issue replacement for respective batting and front view poses. Been a while since my last update but please bump me to 91 as time allows. Picked up several new ones, including these five from Marc del Percio. Up to 77 of the 121 now and getting harder to find these days. But I feel like I'm making decent progress. Add to my 2nd set tally this guy and 9 commons.